Ok – so Kampala is not necessarily known for its sightseeing and I don’t think they had the old taxi park in mind when they christened Uganda the ‘Pearl of Africa’ but Kampala nevertheless has some sites that are definitely worth visiting if for nothing more than to say you did it! If you are travelling round and planning to sight see in Kampala I would suggest that one to two days is plenty to see its attractions. If you’re based here for a while then you can always space them out over weekends or save them all up for visiting friends and relatives. For this reason I have painstakingly put together my list of things to see – and ranked them for your viewing ease. I put this at numero uno mainly because it boasts the best view of all of Kampala from the top of its minaret. The mosque itself is also an impressive building and tourists are allowed to walk around it at will (even taking photos). Built by…yes you guessed it…former Libyan leader/dictator Colonel Gadaffi it is Kampala’s largest mosque. Entrance is 10,000 UGX and women are given a headscarf and sarong to cover up and then taken around by a guide. (pay in the office around the side of the building). This is the historic seat of the Bugandan king, located on Mengo hill exactly one mile up from the Buganda parliament. It is largely unoccupied these days due to the horrific functions in took under the rules of Idi Amin and president Obote. Amin built his torture chamber here, which saw the murder of an estimated 300 people, basically anyone stronger or smarter than Amin or anyone he thought ugly… While you cant go in the palace itself you can get a guided tour around the torture chambers (10,000 UGX) which offers a harrowing, but important, insight into Uganda under Amin. Authentic messages of desperation written on the walls in human excrement and blood remain to tell the tale. Found on Kikaya Hill off the Gayaza rd this is the only one of its kind on the African continent and definitely worth a visit. Located quite far out of town (the other side of the northern bypass) it also boasts the best green space in the whole of Kampala, with extensive grounds, that if you’re not of a spiritual persuasion are a perfect picnic spot and place to spend a chilled out Sunday. If you are of a spiritual nature or just curious about the Bah’ai faith then I recommend the Sunday service (starts at 10.30 am). Again, one of the main draws of this cathedral is the great view it has across Kampala. It is, however, in my opinion, also the most beautiful of Kampala’s Christian cathedrals. Word of warning though – ever since they started renovating it they try and charge any muzungu wandering around with a camera or looking vaguely touristy a 10,000 UGX donation towards the renovation (even if you don’t go in). My advice? Tell them you’re a) worshipping b) got to rush and meet some friends but will be back after and will pay then. For those of you interested in theology or looking to worship – this one’s a protestant church. After you’ve checked out the cathedral you can always also pop to Namirembe guest house for a spot of lunch or down to nearby Java’s for a coffee. Obviously you couldn’t come to Uganda and NOT check out the second largest freshwater lake in the world! A good way to see the lake is by taking a short boat tour on it. You can get a half day boat cruise for around US $80 from Kampala, or even out to Ngamba Chimp Island to see some wildlife (about a 45 minute trip depending on the weather). You can also get a sunset cruise for 25,000 UGX leaving from the Beach House (next to Kampala University), Ggaba at 5.30pm and arriving in Mukono at 11pm with Beach House cruises (tel: 0772435667 / 0752 280100 / 0782 282028) and I’ve heard of people asking fishermen down at the lakeside by Port Bell informally to take them out on the lake and doing a 45-minute trip to Ggaba road fish market for lunch and then back for around 40,000 UGX. Top your trip off with some fresh tilapia on the lakeside at Sssese Islands gateway beach (about 30-40mins outside Kampala off the Entebbe road) or the other numerous lakeside joints and then head up to Cassia lodge hotel (on Buziga Hill just off the Gabba road) for a cocktail to watch the sun set over the lake. Aaah peeerfect. While Uganda may not be know within Africa for its crafts – and lets be honest a lot of them are imported from nearby Kenya and DRC – there is still, however, some good local stuff being made, and whether you’re decorating your house, buying your family 20 identical but ‘authentic’ Christmas presents or just looking for some souvenirs of your time here, the Kampala craft markets offer some good options. The largest craft market is on Buganda rd, central Kampala and is open 7 days a week. Be careful to shop around and haggle before buying anything. Cheaper and often better, however, is the Jukali handicraft village – better known as the ‘Friday craft market’ up in Nsambya, off Gabba rd. It operates to some extent every day but as you can guess from the name only really comes into full force on Fridays. It has a good selection of artwork, jewelry, wooden and stone sculptures as well as a small amount of fabrics. Ok, so not technically speaking in Kampala, but if they can make Kampala’s international airport in Entebbe then I think I can include it in this list. Entrance to the gardens is 3,000 UGX for locals and 10,000 UGX for foreigners. It is definitely worth picking up a guide at the entrance as well, for a bit of background and explanations – including a demo of Tarzan’s vine rope-swinging. Payment of the guide is whatever you want to give them (more or less) but we were so impressed with ours when we went we were happy to pay a lot for his time. For those plant and bird lovers out there there are over 300 different species of plant and countless birds including sunbirds, weavers and eagles. The gardens are open 7 days a week from 9am- 7pm. Located just off the Entebbe road before Entebbe town on Berkeley road. Found on Kira rd it is the biggest and oldest museum in Kampala. Purporting to showcase Uganda’s cultural heritage with displays of ethnological and natural-historical exhibits. It could definitely do with a bit of a spruce up, creative revamp and a dusting. It is in fact a bit like being stuck in a fantasy movie where the long forgotten exhibits come to life at night or transport you to an alternative universe…still it is the main museum in Kampala and for those with a passion for knowledge and artefacts (or a sense of humour) it may still be worth a visit. Opening hours are Monday to Saturday (10.00am to 6.00pm), Sunday and Public Holidays (12 Noon to 6.00pm) and entrance is 1,000 UGX (500 shillings for children) for Ugandans and 3,000 UGX (1,500 UGX for children) for foreigners. If you want to take photos it will cost an extra 5,000 UGX and 20,000 UGX to take a video. Another Cathedral but this one is of the Catholic persuasion. Again this cathedral is located on one of Kampala’s many hills so views are great. Kampala is fabled to have 7 hills. It in fact has 22 but Rubaga is one of the original ones and, therefore, worth a visit for historical reasons. The cathedral also boasts a memorial to the first African Catholic bishop in Uganda martyred for the cause of bringing Catholicism to Uganda and is the current headquarters of the Catholic Church in Uganda. Entrance is free although voluntary contributions are welcome. This website is exactly like In Kampala. Even the name. And they did this article a little over a month ago. Maybe you should try something original next time. Our website has been in the works since long before In Kampala was launched. They beat us to the punch, those sneaky little buggers! Same goes for this article. Written a long time ago, not copied. Feel free to hold onto your In Kampala allegiances if you want. We feel like a great city like Kampala certainly has room for more than one website and ours is going to be a really great resource once we get rolling. We hope that you find our site to be as good as In Kampala and spend some time over here from time to time! Hey Lucy! I love the list, I’m interested in checking out The Uganda National Museum. Can you tell me where exactly on Kira road it’s located? Thanks for putting us out there.. a couple of corrections. 1. 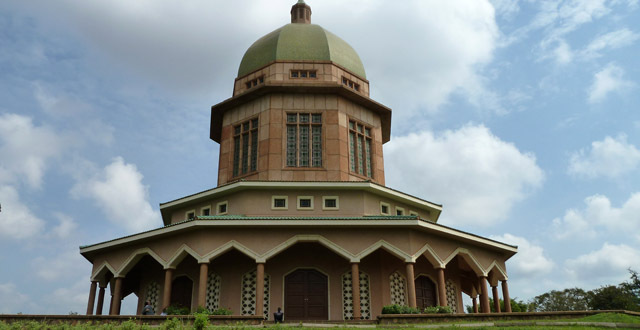 The Gadaffi Mosque was originally constructed by Idi Amin. (source: http://news.bbc.co.uk/2/hi/africa/7305641.stm). 2. In section 8, you state “but if they can make Kampala’s international airport in Entebbe then I think I can include it in this list.” I think you mean Uganda’s international airport. Kampala is a town just as entebbe is. I loved the references to Owino market, I once snagged a lovely Marks and Spencer 2nd hand suit for about $30, it was in perfect shape when i showed up a the office everyone thought i had broken the bank.